TAIPEI, Taiwan (BRAIN) — Despite some challenges facing Taiwan's bicycle market, including a nearly 30 percent drop in exports reported in 2016, the outlook for the 2017 Taipei International Cycle Show, which starts Wednesday, remains relatively positive. TAIPEI, Taiwan (BRAIN) — The numbers are sobering. Last year, Taiwan’s bicycle exports to the U.S. market plunged 27.6 percent, and the overall dollar value dropped 27 percent. 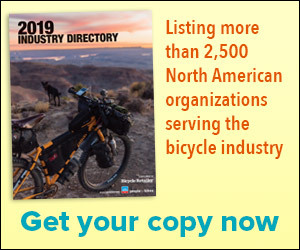 DENVER (BRAIN) — Gates Corporation is looking to the international share bike and industrial/commercial bike market for sales growth of its belt drive systems. TAIPEI, Taiwan (BRAIN) — Taiwan's Microshift is getting into the electric-shifting game, at least conceptually. Microshift said its design is intended for the mid-priced market, not the upper-end market where other brands have introduced their electronic offerings. Good news for brands with less onerous carbon wheel test and relaxed rules for logos on Olympic equipment. Next target? The UCI's 3:1 and minimum bike weight rules. TAIPEI, Taiwan (BRAIN) — The World Federation of the Sporting Goods Industry has made headway on the bike industry's behalf with the UCI and the International Olympic Committee, it announced at a public session at the Taipei Cycle Show on Thursday. TAIPEI, Taiwan (BRAIN) — The venerable aftermarket wheel brand American Classic is looking for growth through an original equipment program it has launched. TAIPEI, Taiwan (BRAIN) — E-thirteen has created a stronger DH rear wheel design by reducing the space between its proprietary 7-speed cassette and the hub's drive-side spoke flange. The new LG1R Carbon wheel is going to be raced this season by DH star Aaron Gwin. TAIPEI, Taiwan (BRAIN) — Tim Krueger, the founder of Advocate Cycles, a boutique off-road bike brand from Minnesota, is prepping a line of tires under the Wend label. Krueger will launch the full line at the Interbike show this fall. TAIPEI, Taiwan (BRAIN) — The principals of major companies from around the world shared the stage on the opening day of the Taipei Cycle Show for the first-ever advocacy Leaders' Panel. Mountain bike exports were strongest; complete bike sales to the U.S. and Europe saw double-digit growth. TAIPEI, Taiwan (BRAIN) — Despite challenging global economic conditions, the Taipei Cycle Show opened on a high note Tuesday thanks to encouraging sales figures presented by the Taiwan Bicycle Association at the show's opening ceremony. TAIPEI, Taiwan (BRAIN) — As he has done before, Trek's president, John Burke, has challenged the bike industry to support advocacy.